Osteoporosis is a disease in which bone weakening increases the risk of a broken bone. It is the most common reason for a broken bone among the elderly. Bones that commonly break include the vertebrae in the spine, the bones of the forearm, and the hip. Until a broken bone occurs there are typically no symptoms. Bones may weaken to such a degree that a break may occur with minor stress or spontaneously. Chronic pain and a decreased ability to carry out normal activities may occur following a broken bone. Osteoporosis may be due to lower-than-normal maximum bone mass and greater-than-normal bone loss. 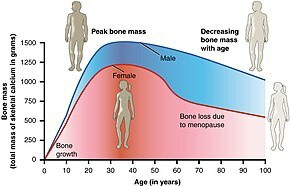 Bone loss increases after menopause due to lower levels of estrogen. Osteoporosis may also occur due to a number of diseases or treatments, including alcoholism, anorexia, hyperthyroidism, kidney disease, and surgical removal of the ovaries. Certain medications increase the rate of bone loss, including some antiseizure medications, chemotherapy, proton pump inhibitors, selective serotonin reuptake inhibitors, and glucocorticosteroids. Smoking and too little exercise are also risk factors. Osteoporosis is defined as a bone density of 2.5 standard deviations below that of a young adult. This is typically measured by dual-energy X-ray absorptiometry. Prevention of osteoporosis includes a proper diet during childhood and efforts to avoid medications that increase the rate of bone loss. Efforts to prevent broken bones in those with osteoporosis include a good diet, exercise, and fall prevention. Lifestyle changes such as stopping smoking and not drinking alcohol may help. Biphosphonate medications are useful in those with previous broken bones due to osteoporosis. In those with osteoporosis but no previous broken bones, they are less effective. A number of other medications may also be useful. Osteoporosis becomes more common with age. About 15% of white people in their 50s and 70% of those over 80 are affected. It is more common in women than men. In the developed world, depending on the method of diagnosis, 2% to 8% of males and 9% to 38% of females are affected. Rates of disease in the developing world are unclear. About 22 million women and 5.5 million men in the European Union had osteoporosis in 2010. In the United States in 2010, about eight million women and one to two million men had osteoporosis. White and Asian people are at greater risk. The word "osteoporosis" is from the Greek terms for "porous bones". Fractures are a common symptom of osteoporosis and can result in disability. Acute and chronic pain in the elderly is often attributed to fractures from osteoporosis and can lead to further disability and early mortality. These fractures may also be asymptomatic. The most common osteoporotic fractures are of the wrist, spine, shoulder and hip. 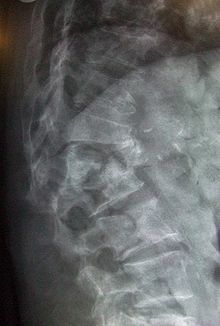 The symptoms of a vertebral collapse ("compression fracture") are sudden back pain, often with radicular pain (shooting pain due to nerve root compression) and rarely with spinal cord compression or cauda equina syndrome. Multiple vertebral fractures lead to a stooped posture, loss of height, and chronic pain with resultant reduction in mobility. Fracture risk calculators assess the risk of fracture based upon several criteria, including bone mineral density, age, smoking, alcohol usage, weight, and gender. Recognized calculators include FRAX and Dubbo. The term "established osteoporosis" is used when a broken bone due to osteoporosis has occurred. Osteoporosis is a part of frailty syndrome. The increased risk of falling associated with aging leads to fractures of the wrist, spine, and hip. The risk of falling, in turn, is increased by impaired eyesight due to any cause (e.g. glaucoma, macular degeneration), balance disorder, movement disorders (e.g. Parkinson's disease), dementia, and sarcopenia (age-related loss of skeletal muscle). Collapse (transient loss of postural tone with or without loss of consciousness) leads to a significant risk of falls; causes of syncope are manifold, but may include cardiac arrhythmias (irregular heart beat), vasovagal syncope, orthostatic hypotension (abnormal drop in blood pressure on standing up), and seizures. Removal of obstacles and loose carpets in the living environment may substantially reduce falls. Those with previous falls, as well as those with gait or balance disorders, are most at risk. Risk factors for osteoporotic fracture can be split between nonmodifiable and (potentially) modifiable. In addition, osteoporosis is a recognized complication of specific diseases and disorders. Medication use is theoretically modifiable, although in many cases, the use of medication that increases osteoporosis risk may be unavoidable. Caffeine is not a risk factor for osteoporosis. It is more common in females than males. 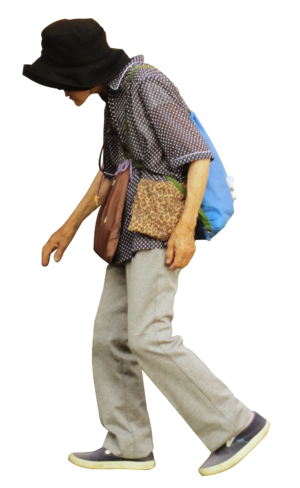 Build: A small stature is also a nonmodifiable risk factor associated with the development of osteoporosis. Excessive alcohol: Although small amounts of alcohol are probably beneficial (bone density increases with increasing alcohol intake), chronic heavy drinking (alcohol intake greater than three units/day) probably increases fracture risk despite any beneficial effects on bone density. In general, immobilization causes bone loss (following the 'use it or lose it' rule). For example, localized osteoporosis can occur after prolonged immobilization of a fractured limb in a cast. This is also more common in active people with a high bone turn-over (for example, athletes). Other examples include bone loss during space flight or in people who are bedridden or use wheelchairs for various reasons. Hypogonadal states can cause secondary osteoporosis. These include Turner syndrome, Klinefelter syndrome, Kallmann syndrome, anorexia nervosa, andropause, hypothalamic amenorrhea or hyperprolactinemia. In females, the effect of hypogonadism is mediated by estrogen deficiency. It can appear as early menopause (<45 years) or from prolonged premenopausal amenorrhea (>1 year). Bilateral oophorectomy (surgical removal of the ovaries) and premature ovarian failure cause deficient estrogen production. In males, testosterone deficiency is the cause (for example, andropause or after surgical removal of the testes). Endocrine disorders that can induce bone loss include Cushing's syndrome, hyperparathyroidism, hyperthyroidism, hypothyroidism, diabetes mellitus type 1 and 2, acromegaly, and adrenal insufficiency. Malnutrition, parenteral nutrition and malabsorption can lead to osteoporosis. Nutritional and gastrointestinal disorders that can predispose to osteoporosis include undiagnosed and untreated coeliac disease (both symptomatic and asymptomatic people), Crohn's disease, ulcerative colitis, cystic fibrosis, surgery (after gastrectomy, intestinal bypass surgery or bowel resection) and severe liver disease (especially primary biliary cirrhosis). People with lactose intolerance or milk allergy may develop osteoporosis due to restrictions of calcium-containing foods. Individuals with bulimia can also develop osteoporosis. Those with an otherwise adequate calcium intake can develop osteoporosis due to the inability to absorb calcium and/or vitamin D. Other micronutrients such as vitamin K or vitamin B12 deficiency may also contribute. Several inherited disorders have been linked to osteoporosis. These include osteogenesis imperfecta, Marfan syndrome, hemochromatosis, hypophosphatasia (for which it is often misdiagnosed), glycogen storage diseases, homocystinuria, Ehlers–Danlos syndrome, porphyria, Menkes' syndrome, epidermolysis bullosa and Gaucher's disease. People with scoliosis of unknown cause also have a higher risk of osteoporosis. Bone loss can be a feature of complex regional pain syndrome. It is also more frequent in people with Parkinson's disease and chronic obstructive pulmonary disease. People with Parkinson's disease have a higher risk of broken bones. This is related to poor balance and poor bone density. In Parkinson’s disease there may be a link between the loss of dopaminergic neurons and altered calcium metabolism (and iron metabolism) causing a stiffening of the skeleton and kyphosis. Certain medications have been associated with an increase in osteoporosis risk; only glucocorticosteroids and anticonvulsants are classically associated, but evidence is emerging with regard to other drugs. Steroid-induced osteoporosis (SIOP) arises due to use of glucocorticoids – analogous to Cushing's syndrome and involving mainly the axial skeleton. The synthetic glucocorticoid prescription drug prednisone is a main candidate after prolonged intake. Some professional guidelines recommend prophylaxis in patients who take the equivalent of more than 30 mg hydrocortisone (7.5 mg of prednisolone), especially when this is in excess of three months. Alternate day use may not prevent this complication. Barbiturates, phenytoin and some other enzyme-inducing antiepileptics – these probably accelerate the metabolism of vitamin D.
L-Thyroxine over-replacement may contribute to osteoporosis, in a similar fashion as thyrotoxicosis does. This can be relevant in subclinical hypothyroidism. Anticoagulants – long-term use of heparin is associated with a decrease in bone density, and warfarin (and related coumarins) have been linked with an increased risk in osteoporotic fracture in long-term use. Age-related bone loss is common among humans due to exhibiting less dense bones than other primate species. Because of the more porous bones of humans, frequency of severe osteoporosis and osteoporosis related fractures is higher. The human vulnerability to osteoporosis is an obvious cost but it can be justified by the advantage of bipedalism inferring that this vulnerability is the byproduct of such. It has been suggested that porous bones help to absorb the increased stress that we have on two surfaces compared to our primate counterparts who have four surfaces to disperse the force. In addition, the porosity allows for more flexibility and a lighter skeleton that is easier to support. One other consideration may be that diets today have much lower amounts of calcium than the diets of other primates or the tetrapedal ancestors to humans which may lead to higher likelihood to show signs of osteoporosis. The underlying mechanism in all cases of osteoporosis is an imbalance between bone resorption and bone formation. In normal bone, matrix remodeling of bone is constant; up to 10% of all bone mass may be undergoing remodeling at any point in time. The process takes place in bone multicellular units (BMUs) as first described by Frost & Thomas in 1963. Osteoclasts are assisted by transcription factor PU.1 to degrade the bone matrix, while osteoblasts rebuild the bone matrix. Low bone mass density can then occur when osteoclasts are degrading the bone matrix faster than the osteoblasts are rebuilding the bone. The three main mechanisms by which osteoporosis develops are an inadequate peak bone mass (the skeleton develops insufficient mass and strength during growth), excessive bone resorption, and inadequate formation of new bone during remodeling, likely due to MSC biasing away from the osteoblast and toward the marrow adipocyte lineage. An interplay of these three mechanisms underlies the development of fragile bone tissue. Hormonal factors strongly determine the rate of bone resorption; lack of estrogen (e.g. as a result of menopause) increases bone resorption, as well as decreasing the deposition of new bone that normally takes place in weight-bearing bones. The amount of estrogen needed to suppress this process is lower than that normally needed to stimulate the uterus and breast gland. The α-form of the estrogen receptor appears to be the most important in regulating bone turnover. In addition to estrogen, calcium metabolism plays a significant role in bone turnover, and deficiency of calcium and vitamin D leads to impaired bone deposition; in addition, the parathyroid glands react to low calcium levels by secreting parathyroid hormone (parathormone, PTH), which increases bone resorption to ensure sufficient calcium in the blood. The role of calcitonin, a hormone generated by the thyroid that increases bone deposition, is less clear and probably not as significant as that of PTH. The activation of osteoclasts is regulated by various molecular signals, of which RANKL (receptor activator of nuclear factor kappa-B ligand) is one of the best studied. This molecule is produced by osteoblasts and other cells (e.g. lymphocytes), and stimulates RANK (receptor activator of nuclear factor κB). Osteoprotegerin (OPG) binds RANKL before it has an opportunity to bind to RANK, and hence suppresses its ability to increase bone resorption. RANKL, RANK and OPG are closely related to tumor necrosis factor and its receptors. The role of the Wnt signaling pathway is recognized, but less well understood. Local production of eicosanoids and interleukins is thought to participate in the regulation of bone turnover, and excess or reduced production of these mediators may underlie the development of osteoporosis. Trabecular bone (or cancellous bone) is the sponge-like bone in the ends of long bones and vertebrae. Cortical bone is the hard outer shell of bones and the middle of long bones. Because osteoblasts and osteoclasts inhabit the surface of bones, trabecular bone is more active and is more subject to bone turnover and remodeling. Not only is bone density decreased, but the microarchitecture of bone is also disrupted. The weaker spicules of trabecular bone break ("microcracks"), and are replaced by weaker bone. Common osteoporotic fracture sites, the wrist, the hip and the spine, have a relatively high trabecular bone to cortical bone ratio. These areas rely on the trabecular bone for strength, so the intense remodeling causes these areas to degenerate most when the remodeling is imbalanced. Around the ages of 30–35, cancellous or trabecular bone loss begins. Women may lose as much as 50%, while men lose about 30%. Light micrograph of an osteoclast displaying typical distinguishing characteristics: a large cell with multiple nuclei and a "foamy" cytosol. Light micrograph of osteoblasts, several displaying a prominent Golgi apparatus, actively synthesizing osteoid containing two osteocytes. In addition to the detection of abnormal BMD, the diagnosis of osteoporosis requires investigations into potentially modifiable underlying causes; this may be done with blood tests. Depending on the likelihood of an underlying problem, investigations for cancer with metastasis to the bone, multiple myeloma, Cushing's disease and other above-mentioned causes may be performed. The main radiographic features of generalized osteoporosis are cortical thinning and increased radiolucency. Frequent complications of osteoporosis are vertebral fractures for which spinal radiography can help considerably in diagnosis and follow-up. Vertebral height measurements can objectively be made using plain-film X-rays by using several methods such as height loss together with area reduction, particularly when looking at vertical deformity in T4-L4, or by determining a spinal fracture index that takes into account the number of vertebrae involved. Involvement of multiple vertebral bodies leads to kyphosis of the thoracic spine, leading to what is known as dowager's hump. The International Society for Clinical Densitometry takes the position that a diagnosis of osteoporosis in men under 50 years of age should not be made on the basis of densitometric criteria alone. It also states, for premenopausal women, Z-scores (comparison with age group rather than peak bone mass) rather than T-scores should be used, and the diagnosis of osteoporosis in such women also should not be made on the basis of densitometric criteria alone. Chemical biomarkers are a useful tool in detecting bone degradation. The enzyme cathepsin K breaks down type-I collagen, an important constituent in bones. Prepared antibodies can recognize the resulting fragment, called a neoepitope, as a way to diagnose osteoporosis. Increased urinary excretion of C-telopeptides, a type-I collagen breakdown product, also serves as a biomarker for osteoporosis. Quantitative computed tomography (QCT) differs from DXA in that it gives separate estimates of BMD for trabecular and cortical bone and reports precise volumetric mineral density in mg/cm3 rather than BMD's relative Z-score. Among QCT's advantages: it can be performed at axial and peripheral sites, can be calculated from existing CT scans without a separate radiation dose, is sensitive to change over time, can analyze a region of any size or shape, excludes irrelevant tissue such as fat, muscle, and air, and does not require knowledge of the patient's subpopulation in order to create a clinical score (e.g. the Z-score of all females of a certain age). Among QCT's disadvantages: it requires a high radiation dose compared to DXA, CT scanners are large and expensive, and because its practice has been less standardized than BMD, its results are more operator-dependent. Peripheral QCT has been introduced to improve upon the limitations of DXA and QCT. Quantitative ultrasound has many advantages in assessing osteoporosis. The modality is small, no ionizing radiation is involved, measurements can be made quickly and easily, and the cost of the device is low compared with DXA and QCT devices. The calcaneus is the most common skeletal site for quantitative ultrasound assessment because it has a high percentage of trabecular bone that is replaced more often than cortical bone, providing early evidence of metabolic change. Also, the calcaneus is fairly flat and parallel, reducing repositioning errors. The method can be applied to children, neonates, and preterm infants, just as well as to adults. Some ultrasound devices can be used on the tibia. The U.S. Preventive Services Task Force (USPSTF) recommend that all women 65 years of age or older be screened by bone densitometry. Additionally they recommend screening younger women with risk factors. There is insufficient evidence to make recommendations about the intervals for repeated screening and the appropriate age to stop screening. In men the harm versus benefit of screening for osteoporosis is unknown. Prescrire states that the need to test for osteoporosis in those who have not had a previous bone fracture is unclear. The International Society for Clinical Densitometry suggest BMD testing for men 70 or older, or those who are indicated for risk equal to that of a 70‑year‑old. A number of tools exist to help determine who is reasonable to test. Lifestyle prevention of osteoporosis is in many aspects the inverse of the potentially modifiable risk factors. As tobacco smoking and high alcohol intake have been linked with osteoporosis, smoking cessation and moderation of alcohol intake are commonly recommended as ways to help prevent it. In people with coeliac disease adherence to a gluten-free diet decreases the risk of developing osteoporosis and increases bone density. The diet must ensure optimal calcium intake (of at least one gram daily) and measuring vitamin D levels is recommended, and to take specific supplements if necessary. 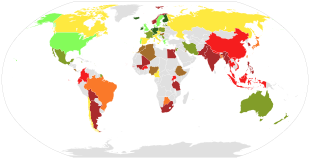 Global dietary calcium intake among adults (mg/day). Global vitamin D serum levels among adults (nmol/L). Studies of the benefits of supplementation with calcium and vitamin D are conflicting, possibly because most studies did not have people with low dietary intakes. A 2018 review by the USPSTF found low-quality evidence that the routine use of calcium and vitamin D supplements (or both supplements together) did not reduce the risk of having an osteoporotic fracture in male and female adults living in the community who had no known history of vitamin D deficiency, osteoporosis, or a fracture. Furthermore, the same review found moderate-quality evidence that the combination of vitamin D and calcium supplementation increases the risk for developing kidney stones in this population. The evidence was insufficient to determine if supplementation with vitamin D, calcium, or the combination of both had an effect on the risk of cancer, cardiovascular disease, or death from any cause. The USPSTF does not recommend low dose supplementation (less than 1 g of calcium and 400 IU of vitamin D) in postmenopausal women as there does not appear to be a difference in fracture risk. A 2015 review found little data that supplementation of calcium decreases the risk of fractures. While some meta-analyses have found a benefit of vitamin D supplements combined with calcium for fractures, they did not find a benefit of vitamin D supplements (800 IU/day or less) alone. While supplementation does not appear to affect the risk of death, there is an increased risk of myocardial infarctions with calcium supplementation, kidney stones, and stomach problems. Vitamin K deficiency is also a risk factor for osteoporotic fractures. The gene gamma-glutamyl carboxylase (GGCX) is dependent on vitamin K. Functional polymorphisms in the gene could attribute to variation in bone metabolism and BMD. Vitamin K2 is also used as a means of treatment for osteoporosis and the polymorphisms of GGCX could explain the individual variation in the response to treatment of vitamin K.
A 2011 review reported a small benefit of physical exercise on bone density of postmenopausal women. The chances of having a fracture were also slightly reduced (absolute difference 4%). People who exercised had on average less bone loss (0.85% at the spine, 1.03% at the hip). Weight-bearing endurance exercise and/or exercises to strengthen muscles improve bone strength in those with osteoporosis. Aerobics, weight bearing, and resistance exercises all maintain or increase BMD in postmenopausal women. Fall prevention can help prevent osteoporosis complications. There is some evidence for hip protectors specifically among those who are in care homes. Bisphosphonates are useful in decreasing the risk of future fractures in those who have already sustained a fracture due to osteoporosis. This benefit is present when taken for three to four years. Different bisphosphonates have not been directly compared, therefore it is unknown if one is better than another. Fracture risk reduction is between 25 and 70% depending on the bone involved. There are concerns of atypical femoral fractures and osteonecrosis of the jaw with long-term use, but these risks are low. With evidence of little benefit when used for more than three to five years and in light of the potential adverse events, it may be appropriate to stop treatment after this time. One medical organization recommends that after five years of medications by mouth or three years of intravenous medication among those at low risk, bisphosphonate treatment can be stopped. In those at higher risk they recommend up to ten years of medication by mouth or six years of intravenous treatment. For those with osteoporosis but who have not had a fracture evidence does not support a reduction in fracture risk with risedronate or etidronate. Alendronate decreases fractures of the spine but does not have any effect on other types of fractures. Half stop their medications within a year. When on treatment with bisphosphonates rechecking bone mineral density is not needed. Another review found tentative evidence of benefit in males with osteoporosis. Fluoride supplementation does not appear to be effective in postmenopausal osteoporosis, as even though it increases bone density, it does not decrease the risk of fractures. Teriparatide (a recombinant parathyroid hormone) has been shown to be effective in treatment of women with postmenopausal osteoporosis. Some evidence also indicates strontium ranelate is effective in decreasing the risk of vertebral and nonvertebral fractures in postmenopausal women with osteoporosis. Hormone replacement therapy, while effective for osteoporosis, is only recommended in women who also have menopausal symptoms. It is not recommended for osteoporosis by itself. Raloxifene, while effective in decreasing vertebral fractures, does not affect the risk of nonvertebral fracture. And while it reduces the risk of breast cancer, it increases the risk of blood clots and strokes. While denosumab is effective at preventing fractures in women, there is not clear evidence of benefit in males. In hypogonadal men, testosterone has been shown to improve bone quantity and quality, but, as of 2008, no studies evaluated its effect on fracture risk or in men with a normal testosterone levels. Calcitonin while once recommended is no longer due to the associated risk of cancer and questionable effect on fracture risk. Certain medications like alendronate, etidronate, risedronate, raloxifene, and strontium ranelate can help to prevent osteoporotic fragility fractures in postmenopausal women with osteoporosis. Although people with osteoporosis have increased mortality due to the complications of fracture, the fracture itself is rarely lethal. Hip fractures can lead to decreased mobility and additional risks of numerous complications (such as deep venous thrombosis and/or pulmonary embolism, and pneumonia). The six-month mortality rate for those aged 50 and above following hip fracture was found to be around 13.5%, with a substantial proportion (almost 13%) needing total assistance to mobilize after a hip fracture. Vertebral fractures, while having a smaller impact on mortality, can lead to a severe chronic pain of neurogenic origin, which can be hard to control, as well as deformity. Though rare, multiple vertebral fractures can lead to such severe hunch back (kyphosis), the resulting pressure on internal organs can impair one's ability to breathe. Apart from risk of death and other complications, osteoporotic fractures are associated with a reduced health-related quality of life. The condition is responsible for millions of fractures annually, mostly involving the lumbar vertebrae, hip, and wrist. Fragility fractures of ribs are also common in men. Hip fractures are responsible for the most serious consequences of osteoporosis. In the United States, more than 250,000 hip fractures annually are attributable to osteoporosis. A 50-year-old white woman is estimated to have a 17.5% lifetime risk of fracture of the proximal femur. The incidence of hip fractures increases each decade from the sixth through the ninth for both women and men for all populations. The highest incidence is found among men and women ages 80 or older. Between 35 and 50% of all women over 50 had at least one vertebral fracture. In the United States, 700,000 vertebral fractures occur annually, but only about a third are recognized. In a series of 9704 women aged 68.8 on average studied for 15 years, 324 had already suffered a vertebral fracture at entry into the study and 18.2% developed a vertebral fracture, but that risk rose to 41.4% in women who had a previous vertebral fracture. In the United States, 250,000 wrist fractures annually are attributable to osteoporosis. Wrist fractures are the third most common type of osteoporotic fractures. The lifetime risk of sustaining a Colles' fracture is about 16% for white women. By the time women reach age 70, about 20% have had at least one wrist fracture. Fragility fractures of the ribs are common in men as young as age 35. These are often overlooked as signs of osteoporosis, as these men are often physically active and suffer the fracture in the course of physical activity. An example would be as a result of falling while water skiing or jet skiing. However, a quick test of the individual's testosterone level following the diagnosis of the fracture will readily reveal whether that individual might be at risk. It is estimated that 200 million people have osteoporosis. Osteoporosis becomes more common with age. About 15% of White people in their 50s and 70% of those over 80 are affected. It is more common in women than men. In the developed world, depending on the method of diagnosis, 2% to 8% of males and 9% to 38% of females are affected. Rates of disease in the developing world are unclear. There are 8.9 million fractures worldwide per year due to osteoporosis. Globally, 1 in 3 women and 1 in 5 men over the age of 50 will have an osteoporotic fracture. Data from the United States shows a decrease in osteoporosis within the general population and in white women, from 18% in 1994 to 10% in 2006. White and Asian people are at greater risk. People of African descent are at a decreased risk of fractures due to osteoporosis, although they have the highest risk of death following an osteoporotic fracture. It has been shown that latitude affects risk of osteoporotic fracture. Areas of higher latitude such as Northern Europe receive less Vitamin D through sunlight compared to regions closer to the equator, and consequently have higher fracture rates in comparison to lower latitudes. For example, Swedish men and women have a 13% and 28.5% risk of hip fracture by age 50, respectively, whereas this risk is only 1.9% and 2.4% in Chinese men and women. Diet may also be a factor that is responsible for this difference, as vitamin D, calcium, magnesium, and folate are all linked to bone mineral density. About 22 million women and 5.5 million men in the European Union had osteoporosis in 2010. In the United States in 2010 about 8 million women and one to 2 million men had osteoporosis. This places a large economic burden on the healthcare system due to costs of treatment, long-term disability, and loss of productivity in the working population. The EU spends 37 billion euros per year in healthcare costs related to osteoporosis, and the US spends an estimated 19 billion USD annually for related healthcare costs. The link between age-related reductions in bone density and fracture risk goes back at least to Astley Cooper, and the term "osteoporosis" and recognition of its pathological appearance is generally attributed to the French pathologist Jean Lobstein. The American endocrinologist Fuller Albright linked osteoporosis with the postmenopausal state. Bisphosphonates were discovered in the 1960s. Anthropologists have studied skeletal remains that showed loss of bone density and associated structural changes that were linked to a chronic malnutrition in the agricultural area in which these individuals lived. "It follows that the skeletal deformation may be attributed to their heavy labor in agriculture as well as to their chronic malnutrition", causing the osteoporosis seen when radiographs of the remains were made. 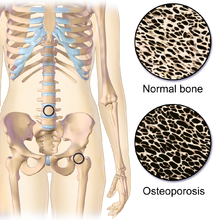 Osteoporosis means "porous bones", from Greek: οστούν/ostoun meaning "bone" and πόρος/poros meaning "pore". ^ a b c d e f g h i j k l m n o p q r s t u v w x y z "Handout on Health: Osteoporosis". August 2014. Archived from the original on 18 May 2015. Retrieved 16 May 2015. ^ a b c d e f g h i j k l m n o p q r s WHO Scientific Group on the Prevention and Management of Osteoporosis (2000 : Geneva, Switzerland) (2003). Prevention and management of osteoporosis : report of a WHO scientific group (PDF). pp. 7, 31. ISBN 978-9241209212. Archived (PDF) from the original on 16 July 2007. ^ a b c d e Wells GA, Cranney A, Peterson J, Boucher M, Shea B, Robinson V, Coyle D, Tugwell P (January 2008). "Alendronate for the primary and secondary prevention of osteoporotic fractures in postmenopausal women". The Cochrane Database of Systematic Reviews (1): CD001155. doi:10.1002/14651858.CD001155.pub2. PMID 18253985. ^ a b c d e Wells G, Cranney A, Peterson J, Boucher M, Shea B, Robinson V, Coyle D, Tugwell P (January 2008). "Risedronate for the primary and secondary prevention of osteoporotic fractures in postmenopausal women". The Cochrane Database of Systematic Reviews (1): CD004523. doi:10.1002/14651858.CD004523.pub3. PMID 18254053. ^ a b c "Chronic rheumatic conditions". World Health Organization. Archived from the original on 27 April 2015. Retrieved 18 May 2015. ^ Golob AL, Laya MB (May 2015). "Osteoporosis: screening, prevention, and management". The Medical Clinics of North America. 99 (3): 587–606. doi:10.1016/j.mcna.2015.01.010. PMID 25841602. ^ a b Wells GA, Cranney A, Peterson J, Boucher M, Shea B, Robinson V, Coyle D, Tugwell P (January 2008). "Etidronate for the primary and secondary prevention of osteoporotic fractures in postmenopausal women". The Cochrane Database of Systematic Reviews (1): CD003376. doi:10.1002/14651858.CD003376.pub3. PMID 18254018. ^ Nelson, H. D; Haney, E. M; Chou, R; Dana, T; Fu, R; Bougatsos, C (2010). "Screening for Osteoporosis: Systematic Review to Update the 2002 U.S. Preventive Services Task Force Recommendation [Internet]". Agency for Healthcare Research and Quality. PMID 20722176. ^ a b c d Wade SW, Strader C, Fitzpatrick LA, Anthony MS, O'Malley CD (2014). "Estimating prevalence of osteoporosis: examples from industrialized countries". Archives of Osteoporosis. 9 (1): 182. doi:10.1007/s11657-014-0182-3. PMID 24847682. ^ a b Handa R, Ali Kalla A, Maalouf G (August 2008). "Osteoporosis in developing countries". Best Practice & Research. Clinical Rheumatology. 22 (4): 693–708. doi:10.1016/j.berh.2008.04.002. PMID 18783745. ^ a b Svedbom A, Hernlund E, Ivergård M, Compston J, Cooper C, Stenmark J, McCloskey EV, Jönsson B, Kanis JA (2013). "Osteoporosis in the European Union: a compendium of country-specific reports". Archives of Osteoporosis. 8 (1–2): 137. doi:10.1007/s11657-013-0137-0. PMC 3880492. PMID 24113838. ^ a b Willson T, Nelson SD, Newbold J, Nelson RE, LaFleur J (2015). "The clinical epidemiology of male osteoporosis: a review of the recent literature". Clinical Epidemiology. 7: 65–76. doi:10.2147/CLEP.S40966. PMC 4295898. PMID 25657593. ^ King TL, Brucker MC (2011). Pharmacology for women's health. Sudbury, Mass. : Jones and Bartlett Publishers. p. 1004. ISBN 9780763753290. Archived from the original on 8 September 2017. ^ Kasper, Dennis L.; Fauci, Anthony S.; Hauser, Stephen L.; Longo, Dan L.; Larry Jameson, J.; Loscalzo, Joseph (6 February 2018). Harrison's principles of internal medicine. Jameson, J. Larry,, Kasper, Dennis L.,, Fauci, Anthony S., 1940-, Hauser, Stephen L.,, Longo, Dan L. (Dan Louis), 1949-, Loscalzo, Joseph (Twentieth ed.). New York. ISBN 9781259644047. OCLC 990065894. ^ Old JL, Calvert M (2004). "Vertebral compression fractures in the elderly". American Family Physician. 69 (1): 111–16. PMID 14727827. Archived from the original on 5 August 2011. Retrieved 31 March 2011. ^ Kim DH, Vaccaro AR (2006). "Osteoporotic compression fractures of the spine; current options and considerations for treatment". The Spine Journal. 6 (5): 479–87. doi:10.1016/j.spinee.2006.04.013. PMID 16934715. ^ Susan Ott. "Fracture Risk Calculator". Archived from the original on 14 October 2009. Retrieved 3 November 2009. ^ a b c WHO (1994). "Assessment of fracture risk and its application to screening for postmenopausal osteoporosis. Report of a WHO Study Group". World Health Organization Technical Report Series. 843: 1–129. PMID 7941614. ^ Ganz DA, Bao Y, Shekelle PG, Rubenstein LZ (2007). "Will my patient fall?". JAMA. 297 (1): 77–86. doi:10.1001/jama.297.1.77. PMID 17200478. ^ Waugh EJ, Lam MA, Hawker GA, McGowan J, Papaioannou A, Cheung AM, Hodsman AB, Leslie WD, Siminoski K, Jamal SA (January 2009). "Risk factors for low bone mass in healthy 40–60 year old women: a systematic review of the literature". Osteoporosis International. 20 (1): 1–21. doi:10.1007/s00198-008-0643-x. PMC 5110317. PMID 18523710. ^ "6.6 Exercise, Nutrition, Hormones, and Bone Tissue". Anatomy & Physiology. Openstax CNX. 2013. ISBN 978-1-938168-13-0. Archived from the original on 10 January 2017. ^ Sinnesael M, Claessens F, Boonen S, Vanderschueren D (2013). "Novel insights in the regulation and mechanism of androgen action on bone". Current Opinion in Endocrinology, Diabetes and Obesity. 20 (3): 240–44. doi:10.1097/MED.0b013e32835f7d04. PMID 23449008. ^ Sinnesael M, Boonen S, Claessens F, Gielen E, Vanderschueren D (2011). "Testosterone and the male skeleton: a dual mode of action". Journal of Osteoporosis. 2011: 1–7. doi:10.4061/2011/240328. PMC 3173882. PMID 21941679. ^ Melton LJ (2003). "Epidemiology worldwide". Endocrinol. Metab. Clin. North Am. 32 (1): v, 1–13. doi:10.1016/S0889-8529(02)00061-0. PMID 12699289. ^ a b c d e Raisz L (2005). "Pathogenesis of osteoporosis: concepts, conflicts, and prospects". J Clin Invest. 115 (12): 3318–25. doi:10.1172/JCI27071. PMC 1297264. PMID 16322775. Archived from the original on 24 August 2007. ^ Ojo F, Al Snih S, Ray LA, Raji MA, Markides KS (2007). "History of fractures as predictor of subsequent hip and nonhip fractures among older Mexican Americans". Journal of the National Medical Association. 99 (4): 412–18. PMC 2569658. PMID 17444431. ^ a b Brian K Alldredge; Koda-Kimble, Mary Anne; Young, Lloyd Y.; Wayne A Kradjan; B. Joseph Guglielmo (2009). Applied therapeutics: the clinical use of drugs. Philadelphia: Wolters Kluwer Health/Lippincott Williams & Wilkins. pp. 101–03. ISBN 978-0-7817-6555-8. ^ a b Poole KE, Compston JE (December 2006). "Osteoporosis and its management". BMJ. 333 (7581): 1251–56. doi:10.1136/bmj.39050.597350.47. PMC 1702459. PMID 17170416. ^ Berg KM, Kunins HV, Jackson JL, Nahvi S, Chaudhry A, Harris KA, Malik R, Arnsten JH (2008). "Association between alcohol consumption and both osteoporotic fracture and bone density". Am J Med. 121 (5): 406–18. doi:10.1016/j.amjmed.2007.12.012. PMC 2692368. PMID 18456037. ^ Nieves JW (2005). "Osteoporosis: the role of micronutrients". Am J Clin Nutr. 81 (5): 1232S–39S. doi:10.1093/ajcn/81.5.1232. PMID 15883457. Archived from the original on 24 April 2008. ^ Gielen E, Boonen S, Vanderschueren D, Sinnesael M, Verstuyf A, Claessens F, Milisen K, Verschueren S (2011). "Calcium and vitamin d supplementation in men". Journal of Osteoporosis. 2011: 1–6. doi:10.4061/2011/875249. PMC 3163142. PMID 21876835. ^ Wong PK, Christie JJ, Wark JD (2007). "The effects of smoking on bone health". Clin. Sci. 113 (5): 233–41. doi:10.1042/CS20060173. PMID 17663660. ^ Ilich JZ, Kerstetter JE (2000). 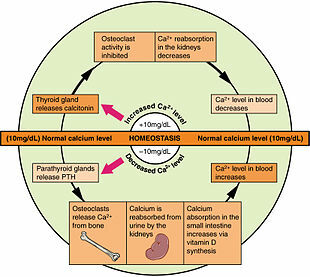 "Nutrition in Bone Health Revisited: A Story Beyond Calcium". Journal of the American College of Nutrition. 19 (6): 715–37. doi:10.1080/07315724.2000.10718070. PMID 11194525. Archived from the original on 7 August 2009. Retrieved 6 October 2009. ^ Weiss LA, Barrett-Connor E, von Mühlen D (2005). "Ratio of n−6 to n−3 fatty acids and bone mineral density in older adults: the Rancho Bernardo Study". Am J Clin Nutr. 81 (4): 934–38. doi:10.1093/ajcn/81.4.934. PMID 15817874. Archived from the original on 24 October 2009. ^ Abelow BJ, Holford TR, Insogna KL (1992). "Cross-cultural association between dietary animal protein and hip fracture: a hypothesis". Calcified Tissue International. 50 (1): 14–18. CiteSeerX 10.1.1.674.9378. doi:10.1007/BF00297291. PMID 1739864. ^ Hegsted M, Schuette SA, Zemel MB, Linkswiler HM (1981). "Urinary calcium and calcium balance in young men as affected by level of protein and phosphorus intake". The Journal of Nutrition. 111 (3): 553–62. doi:10.1093/jn/111.3.553. PMID 7205408. ^ Kerstetter JE, Allen LH (1990). "Dietary protein increases urinary calcium" (PDF). Journal of Nutrition. 120 (1): 134–36. doi:10.1093/jn/120.1.134. PMID 2406396. ^ Feskanich D, Willett WC, Stampfer MJ, Colditz GA (1996). "Protein consumption and bone fractures in women". Am. J. Epidemiol. 143 (5): 472–79. doi:10.1093/oxfordjournals.aje.a008767. PMID 8610662. ^ Kerstetter JE, Kenny AM, Insogna KL (2011). "Dietary protein and skeletal health: A review of recent human research". Current Opinion in Lipidology. 22 (1): 16–20. doi:10.1097/MOL.0b013e3283419441. PMC 4659357. PMID 21102327. ^ Bonjour JP (2005). "Dietary protein: An essential nutrient for bone health". Journal of the American College of Nutrition. 24 (6 Suppl): 526S–36S. doi:10.1080/07315724.2005.10719501. PMID 16373952. ^ Kerstetter JE, O'Brien KO, Insogna KL (2003). "Dietary protein, calcium metabolism, and skeletal homeostasis revisited". Am. J. Clin. Nutr. 78 (3 Suppl): 584S–92S. doi:10.1093/ajcn/78.3.584S. PMID 12936953. ^ Schönau E, Werhahn E, Schiedermaier U, Mokow E, Schiessl H, Scheidhauer K, Michalk D (1996). "Influence of muscle strength on bone strength during childhood and adolescence". Hormone Research. 45 (Suppl. 1): 63–66. doi:10.1159/000184834. PMID 8805035. ^ Shapses SA, Riedt CS (1 June 2006). "Bone, body weight, and weight reduction: what are the concerns?". J. Nutr. 136 (6): 1453–56. doi:10.1093/jn/136.6.1453. PMC 4016235. PMID 16702302. Archived from the original on 10 March 2008. ^ Pollock N, Grogan C, Perry M, Pedlar C, Cooke K, Morrissey D, Dimitriou L (2010). "Bone-mineral density and other features of the female athlete triad in elite endurance runners: A longitudinal and cross-sectional observational study". International Journal of Sport Nutrition and Exercise Metabolism. 20 (5): 418–26. doi:10.1123/ijsnem.20.5.418. PMID 20975110. ^ Gibson JH, Mitchell A, Harries MG, Reeve J (2004). "Nutritional and exercise-related determinants of bone density in elite female runners". Osteoporosis International. 15 (8): 611–18. doi:10.1007/s00198-004-1589-2. PMID 15048548. ^ Hetland ML, Haarbo J, Christiansen C (1993). "Low bone mass and high bone turnover in male long distance runners". The Journal of Clinical Endocrinology and Metabolism. 77 (3): 770–75. doi:10.1210/jcem.77.3.8370698. PMID 8370698. ^ Brahm H, Ström H, Piehl-Aulin K, Mallmin H, Ljunghall S (1997). "Bone metabolism in endurance trained athletes: A comparison to population-based controls based on DXA, SXA, quantitative ultrasound, and biochemical markers". Calcified Tissue International. 61 (6): 448–54. doi:10.1007/s002239900366. PMID 9383270. ^ MacKelvie KJ, Taunton JE, McKay HA, Khan KM (2000). "Bone mineral density and serum testosterone in chronically trained, high mileage 40–55 year old male runners". British Journal of Sports Medicine. 34 (4): 273–78. doi:10.1136/bjsm.34.4.273. PMC 1724199. PMID 10953900. ^ Staessen JA, Roels HA, Emelianov D, Kuznetsova T, Thijs L, Vangronsveld J, Fagard R (1999). "Environmental exposure to cadmium, forearm bone density, and risk of fractures: prospective population study. Public Health and Environmental Exposure to Cadmium (PheeCad) Study Group". Lancet. 353 (9159): 1140–44. doi:10.1016/S0140-6736(98)09356-8. PMID 10209978. ^ Tucker KL, Morita K, Qiao N, Hannan MT, Cupples LA, Kiel DP (2006). "Colas, but not other carbonated beverages, are associated with low bone mineral density in older women: The Framingham Osteoporosis Study". Am. J. Clin. Nutr. 84 (4): 936–42. doi:10.1093/ajcn/84.4.936. PMID 17023723. ^ American Academy of Pediatrics Committee on School Health (2004). "Soft drinks in schools". Pediatrics. 113 (1 Pt 1): 152–54. doi:10.1542/peds.113.1.152. PMID 14702469. ^ Zhou B, Huang Y, Li H, Sun W, Liu J (January 2016). "Proton-pump inhibitors and risk of fractures: an update meta-analysis". Osteoporosis International. 27 (1): 339–47. doi:10.1007/s00198-015-3365-x. PMID 26462494. ^ a b c d e Simonelli, C; et al. (July 2006). "ICSI Health Care Guideline: Diagnosis and Treatment of Osteoporosis, 5th edition". Institute for Clinical Systems Improvement. Archived from the original (PDF) on 18 July 2007. Retrieved 8 April 2008. ^ a b c d e f g h i j k l Kohlmeier, Lynn Kohlmeier (1998). "Osteoporosis – Risk Factors, Screening, and Treatment". Medscape Portals. Archived from the original on 19 December 2008. Retrieved 11 May 2008. ^ a b c Ebeling PR (2008). "Clinical practice. Osteoporosis in men". N Engl J Med. 358 (14): 1474–82. doi:10.1056/NEJMcp0707217. PMID 18385499. ^ a b Mirza F, Canalis E (September 2015). "Management of endocrine disease: Secondary osteoporosis: pathophysiology and management". Eur J Endocrinol (Review). 173 (3): R131–51. doi:10.1530/EJE-15-0118. PMC 4534332. PMID 25971649. ^ a b c Henwood MJ, Binkovitz L (2009). "Update on pediatric bone health". The Journal of the American Osteopathic Association. 109 (1): 5–12. PMID 19193819. Archived from the original on 4 March 2016. Retrieved 23 April 2013. ^ Beto JA (January 2015). "The role of calcium in human aging". Clin Nutr Res (Review). 4 (1): 1–8. doi:10.7762/cnr.2015.4.1.1. PMC 4337919. PMID 25713787. ^ Mornet, PhD, Etienne; Nunes, MD, Mark E (20 November 2007). "Hypophosphatasia". GeneReviews: Hypophostasia. NCBI. Archived from the original on 18 January 2017. ^ "Hypophosphatasia Case Studies: Dangers of Misdiagnosis". Hypophosphatasia.com. Archived from the original on 8 August 2014. Retrieved 5 August 2014. ^ Invernizzi M, Carda S, Viscontini GS, Cisari C (2009). "Osteoporosis in Parkinson's disease". Parkinsonism & Related Disorders. 15 (5): 339–46. doi:10.1016/j.parkreldis.2009.02.009. PMID 19346153. ^ Celsi F, Pizzo P, Brini M, Leo S, Fotino C, Pinton P, Rizzuto R (2009). "Mitochondria, calcium and cell death: A deadly triad in neurodegeneration". Biochimica et Biophysica Acta (BBA) - Bioenergetics. 1787 (5): 335–44. doi:10.1016/j.bbabio.2009.02.021. PMC 2696196. PMID 19268425. ^ Gourlay M, Franceschini N, Sheyn Y (2007). "Prevention and treatment strategies for glucocorticoid-induced osteoporotic fractures". Clin Rheumatol. 26 (2): 144–53. doi:10.1007/s10067-006-0315-1. PMID 16670825. ^ Petty SJ, O'Brien TJ, Wark JD (2007). "Anti-epileptic medication and bone health". Osteoporosis International. 18 (2): 129–42. doi:10.1007/s00198-006-0185-z. PMID 17091219. ^ Ruiz-Irastorza G, Khamashta MA, Hughes GR (2002). "Heparin and osteoporosis during pregnancy: 2002 update". Lupus. 11 (10): 680–82. doi:10.1191/0961203302lu262oa. PMID 12413068. ^ Gage BF, Birman-Deych E, Radford MJ, Nilasena DS, Binder EF (2006). "Risk of osteoporotic fracture in elderly patients taking warfarin: results from the National Registry of Atrial Fibrillation 2". Arch. Intern. Med. 166 (2): 241–46. doi:10.1001/archinte.166.2.241. PMID 16432096. ^ Murphy CE, Rodgers PT (2007). "Effects of thiazolidinediones on bone loss and fracture". Annals of Pharmacotherapy. 41 (12): 2014–18. doi:10.1345/aph.1K286. PMID 17940125. ^ a b Latimer B (2005). "The perils of being bipedal". Ann Biomed Eng. 33 (1): 3–6. doi:10.1007/s10439-005-8957-8. PMID 15709701. ^ Eaton SB, Nelson DA (1991). "Calcium in evolutionary perspective". Am. J. Clin. Nutr. 54 (1 Suppl): 281S–87S. doi:10.1093/ajcn/54.1.281S. PMID 2053574. ^ Frost HM, Thomas CC. Bone Remodeling Dynamics. Springfield, IL: 1963. ^ Wu, Shuyan (2013). "Genome-wide approaches for identifying genetic risk factors for osteoporosis". Genome Med. 5 (5): 44. doi:10.1186/gm448. PMC 3706967. PMID 23731620. ^ Paccou J, Hardouin P, Cotten A, Penel G, Cortet B (October 2015). "The Role of Bone Marrow Fat in Skeletal Health: Usefulness and Perspectives for Clinicians". The Journal of Clinical Endocrinology and Metabolism. 100 (10): 3613–21. doi:10.1210/jc.2015-2338. PMID 26244490. ^ a b c Guglielmi G, Scalzo G (6 May 2010). "Imaging tools transform diagnosis of osteoporosis". Diagnostic Imaging Europe. 26: 7–11. Archived from the original on 2 June 2010. ^ Yasuda Y, Kaleta J, Brömme D (2005). "The role of cathepsins in osteoporosis and arthritis: rationale for the design of new therapeutics". Adv. Drug Deliv. Rev. 57 (7): 973–93. doi:10.1016/j.addr.2004.12.013. PMID 15876399. ^ Meunier, Pierre (1998). Osteoporosis: Diagnosis and Management. London: Taylor and Francis. ISBN 978-1-85317-412-4. ^ a b c Curry SJ, Krist AH, Owens DK, Barry MJ, Caughey AB, Davidson KW, Doubeni CA, Epling JW, Kemper AR, Kubik M, Landefeld CS, Mangione CM, Phipps MG, Pignone M, Silverstein M, Simon MA, Tseng CW, Wong JB (June 2018). "Screening for Osteoporosis to Prevent Fractures: US Preventive Services Task Force Recommendation Statement". JAMA. 319 (24): 2521–2531. doi:10.1001/jama.2018.7498. PMID 29946735. ^ U.S. Preventive Services Task Force (March 2011). "Screening for osteoporosis: U.S. preventive services task force recommendation statement". Annals of Internal Medicine. 154 (5): 356–64. doi:10.7326/0003-4819-154-5-201103010-00307. PMID 21242341. ^ "100 most recent Archives 2017 2016 2015 2014 2013 2012 2011 2010 2009 2008 2007 2006 2005 Bone fragility: preventing fractures". Prescrire International. 26 (181): 103–06. April 2017. Archived from the original on 8 September 2017. ^ International Society for Clinical Densitometry (ISCD). 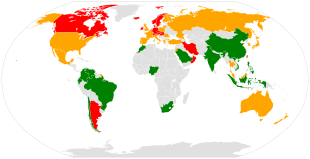 2013 ISCD Official Positions – Adult. (2013). at "2013 ISCD Official Positions - Adult - International Society for Clinical Densitometry (ISCD)". Archived from the original on 5 May 2015. Retrieved 4 May 2015. ^ Rud B, Hilden J, Hyldstrup L, Hróbjartsson A (April 2009). "The Osteoporosis Self-Assessment Tool versus alternative tests for selecting postmenopausal women for bone mineral density assessment: a comparative systematic review of accuracy". Osteoporosis International. 20 (4): 599–607. doi:10.1007/s00198-008-0713-0. PMID 18716823. ^ Ebeling PR, Daly RM, Kerr DA, Kimlin MG (October 2013). "Building healthy bones throughout life: an evidence-informed strategy to prevent osteoporosis in Australia". The Medical Journal of Australia. 199 (7 Suppl): 90–91. doi:10.5694/mja12.11363. hdl:10536/DRO/DU:30060407. PMID 25370432. ^ a b c d e f g h i Body JJ (2011). "How to manage postmenopausal osteoporosis?". Acta Clinica Belgica. 66 (6): 443–7. doi:10.1179/ACB.66.6.2062612. PMID 22338309. ^ Wahl, D. A.; Cooper, C.; Ebeling, P. R.; Eggersdorfer, M.; Hilger, J.; Hoffmann, K.; Josse, R.; Kanis, J. A.; Mithal, A. (29 August 2012). "A global representation of vitamin D status in healthy populations". Archives of Osteoporosis. 7 (1–2): 155–172. doi:10.1007/s11657-012-0093-0. ISSN 1862-3522. PMID 23225293. ^ Wahl, D. A.; Cooper, C.; Ebeling, P. R.; Eggersdorfer, M.; Hilger, J.; Hoffmann, K.; Josse, R.; Kanis, J. A.; Mithal, A. (1 February 2013). "A global representation of vitamin D status in healthy populations: reply to comment by Saadi". Archives of Osteoporosis. 8 (1–2): 122. doi:10.1007/s11657-013-0122-7. ISSN 1862-3522. PMID 23371520. ^ "Drugs for Postmenopausal Osteoporosis". The Medical Letter on Drugs and Therapeutics. 56 (1452): 91–96. 29 September 2014. ^ a b c d e Kahwati LC, Weber RP, Pan H, Gourlay M, LeBlanc E, Coker-Schwimmer M, Viswanathan M (April 2018). "Vitamin D, Calcium, or Combined Supplementation for the Primary Prevention of Fractures in Community-Dwelling Adults: Evidence Report and Systematic Review for the US Preventive Services Task Force". JAMA (Systematic Review & Meta-Analysis). 319 (15): 1600–1612. doi:10.1001/jama.2017.21640. PMID 29677308. ^ "Final Recommendation Statement Vitamin D, Calcium, or Combined Supplementation for the Primary Prevention of Fractures in Community-Dwelling Adults: Preventive Medication". www.uspreventiveservicestaskforce.org. USPSTF Program Office. ^ Bolland MJ, Leung W, Tai V, Bastin S, Gamble GD, Grey A, Reid IR (September 2015). "Calcium intake and risk of fracture: systematic review". BMJ. 351: h4580. doi:10.1136/bmj.h4580. PMC 4784799. PMID 26420387. ^ DIPART Group (January 2010). "Patient level pooled analysis of 68 500 patients from seven major vitamin D fracture trials in US and Europe". BMJ. 340: b5463. doi:10.1136/bmj.b5463. PMC 2806633. PMID 20068257. ^ a b c Avenell A, Mak JC, O'Connell D (April 2014). "Vitamin D and vitamin D analogues for preventing fractures in post-menopausal women and older men". The Cochrane Database of Systematic Reviews. 4 (4): CD000227. doi:10.1002/14651858.CD000227.pub4. PMID 24729336. ^ Bolland MJ, Avenell A, Baron JA, Grey A, MacLennan GS, Gamble GD, Reid IR (2010). "Effect of calcium supplements on risk of myocardial infarction and cardiovascular events: meta-analysis". BMJ (Clinical Research Ed.). 341: c3691. doi:10.1136/bmj.c3691. PMC 2912459. PMID 20671013. ^ Bolland MJ, Grey A, Avenell A, Gamble GD, Reid IR (2011). "Calcium supplements with or without vitamin D and risk of cardiovascular events: reanalysis of the Women's Health Initiative limited access dataset and meta-analysis". BMJ. 342: d2040. doi:10.1136/bmj.d2040. PMC 3079822. PMID 21505219. ^ Hosoi, T (2010). "Genetic aspects of osteoporosis". Journal of Bone and Mineral Metabolism. 28 (6): 601–07. doi:10.1007/s00774-010-0217-9. PMID 20697753. ^ a b c d e Howe TE, Shea B, Dawson LJ, Downie F, Murray A, Ross C, Harbour RT, Caldwell LM, Creed G (2011). "Exercise for preventing and treating osteoporosis in postmenopausal women". Cochrane Database of Systematic Reviews. Art. No. : CD000333 (7): CD000333. doi:10.1002/14651858.CD000333.pub2. PMID 21735380 – via Cochrane Database of Systematic Reviews. ^ Body JJ, Bergmann P, Boonen S, Boutsen Y, Bruyere O, Devogelaer JP, Goemaere S, Hollevoet N, Kaufman JM, Milisen K, Rozenberg S, Reginster JY (2011). "Non-pharmacological management of osteoporosis: a consensus of the Belgian Bone Club". Osteoporos Int. 22 (11): 2769–88. doi:10.1007/s00198-011-1545-x. PMC 3186889. PMID 21360219. ^ Kasturi GC, Adler RA (2011). "Osteoporosis: nonpharmacologic management". PM&R. 3 (6): 562–72. doi:10.1016/j.pmrj.2010.12.014. PMID 21478069. ^ a b Whitaker M, Guo J, Kehoe T, Benson G (May 2012). "Bisphosphonates for osteoporosis--where do we go from here?". The New England Journal of Medicine. 366 (22): 2048–51. doi:10.1056/NEJMp1202619. PMID 22571168. ^ Suresh E, Pazianas M, Abrahamsen B (January 2014). "Safety issues with bisphosphonate therapy for osteoporosis". Rheumatology. 53 (1): 19–31. doi:10.1093/rheumatology/ket236. PMID 23838024. ^ a b Adler RA, El-Hajj Fuleihan G, Bauer DC, Camacho PM, Clarke BL, Clines GA, Compston JE, Drake MT, Edwards BJ, Favus MJ, Greenspan SL, McKinney R, Pignolo RJ, Sellmeyer DE (January 2016). "Managing Osteoporosis in Patients on Long-Term Bisphosphonate Treatment: Report of a Task Force of the American Society for Bone and Mineral Research". Journal of Bone and Mineral Research. 31 (1): 16–35. doi:10.1002/jbmr.2708. PMC 4906542. PMID 26350171. ^ a b c Qaseem A, Forciea MA, McLean RM, Denberg TD (June 2017). "Treatment of Low Bone Density or Osteoporosis to Prevent Fractures in Men and Women: A Clinical Practice Guideline Update From the American College of Physicians". Annals of Internal Medicine. 166 (11): 818–839. doi:10.7326/M15-1361. PMID 28492856. ^ Davis S, Sachdeva A, Goeckeritz B, Oliver A (2010). "Approved treatments for osteoporosis and what's in the pipeline". Drug Benefit Trends. 22 (4): 121–24. Archived from the original on 28 July 2010. ^ a b Nayak S, Greenspan SL (March 2017). "Osteoporosis Treatment Efficacy for Men: A Systematic Review and Meta-Analysis". Journal of the American Geriatrics Society. 65 (3): 490–495. doi:10.1111/jgs.14668. PMC 5358515. PMID 28304090. ^ Haguenauer D, Welch V, Shea B, Tugwell P, Wells G (2000). "Fluoride for treating postmenopausal osteoporosis". The Cochrane Database of Systematic Reviews (4): CD002825. doi:10.1002/14651858.CD002825. PMID 11034769. ^ Vestergaard P, Jorgensen NR, Schwarz P, Mosekilde L (March 2008). "Effects of treatment with fluoride on bone mineral density and fracture risk--a meta-analysis". Osteoporosis International. 19 (3): 257–68. doi:10.1007/s00198-007-0437-6. PMID 17701094. ^ Han SL, Wan SL (February 2012). "Effect of teriparatide on bone mineral density and fracture in postmenopausal osteoporosis: meta-analysis of randomised controlled trials". International Journal of Clinical Practice. 66 (2): 199–209. doi:10.1111/j.1742-1241.2011.02837.x. PMID 22257045. ^ O'Donnell S, Cranney A, Wells GA, Adachi JD, Reginster JY (October 2006). "Strontium ranelate for preventing and treating postmenopausal osteoporosis". The Cochrane Database of Systematic Reviews (4): CD005326. doi:10.1002/14651858.CD005326.pub3. PMID 17054253. ^ "Background Document for Meeting of Advisory Committee for Reproductive Health Drugs and Drug Safety and Risk Management Advisory Committee" (PDF). FDA. March 2013. Archived (PDF) from the original on 9 June 2013. ^ "Osteoporosis – primary prevention (TA160) : Alendronate, etidronate, risedronate, raloxifene and strontium ranelate for the primary prevention of osteoporotic fragility fractures in postmenopausal women". UK: National Institute for Health and Care Excellence (NICE). January 2011. Archived from the original on 22 October 2013. ^ Cranney A, Jamal SA, Tsang JF, Josse RG, Leslie WD (2007). "Low bone mineral density and fracture burden in postmenopausal women". CMAJ. 177 (6): 575–80. doi:10.1503/cmaj.070234. PMC 1963365. PMID 17846439. ^ Hannan EL, Magaziner J, Wang JJ, Eastwood EA, Silberzweig SB, Gilbert M, Morrison RS, McLaughlin MA, Orosz GM, Siu AL (2001). "Mortality and locomotion 6 months after hospitalization for hip fracture: risk factors and risk-adjusted hospital outcomes". JAMA. 285 (21): 2736–42. doi:10.1001/jama.285.21.2736. PMID 11386929. ^ Brenneman SK, Barrett-Connor E, Sajjan S, Markson LE, Siris ES (2006). "Impact of recent fracture on health-related quality of life in postmenopausal women". J. Bone Miner. Res. 21 (6): 809–16. doi:10.1359/jbmr.060301. PMID 16753011. ^ a b Riggs BL, Melton LJ (1995). "The worldwide problem of osteoporosis: insights afforded by epidemiology". Bone. 17 (5 Suppl): 505S–11S. doi:10.1016/8756-3282(95)00258-4. PMID 8573428. ^ a b "MerckMedicus Modules: Osteoporosis – Epidemiology". Merck & Co., Inc. Archived from the original on 28 December 2007. Retrieved 13 June 2008. ^ Cauley JA, Hochberg MC, Lui LY, Palermo L, Ensrud KE, Hillier TA, Nevitt MC, Cummings SR (2007). "Long-term risk of incident vertebral fractures". JAMA. 298 (23): 2761–67. doi:10.1001/jama.298.23.2761. PMID 18165669. ^ a b c Kanis JA, Odén A, McCloskey EV, Johansson H, Wahl DA, Cooper C (September 2012). "A systematic review of hip fracture incidence and probability of fracture worldwide". Osteoporosis International. 23 (9): 2239–56. doi:10.1007/s00198-012-1964-3. PMC 3421108. PMID 22419370. ^ International Osteoporosis Foundation. Epidemiology Archived 9 August 2015 at the Wayback Machine. ^ a b c "The Global Burden of Osteoporosis | International Osteoporosis Foundation". www.iofbonehealth.org. Archived from the original on 5 March 2016. Retrieved 9 February 2016. ^ a b c Cauley, Jane A. (23 March 2011). "Defining Ethnic and Racial Differences in Osteoporosis and Fragility Fractures". Clinical Orthopaedics and Related Research. 469 (7): 1891–99. doi:10.1007/s11999-011-1863-5. ISSN 0009-921X. PMC 3111798. PMID 21431462. ^ Herrmann M, Peter Schmidt J, Umanskaya N, Wagner A, Taban-Shomal O, Widmann T, Colaianni G, Wildemann B, Herrmann W (2007). "The role of hyperhomocysteinemia as well as folate, vitamin B(6) and B(12) deficiencies in osteoporosis: a systematic review". Clinical Chemistry and Laboratory Medicine. 45 (12): 1621–32. doi:10.1515/cclm.2007.362. PMID 18067447. ^ Gerald N. Grob (2014). Aging Bones: A Short History of Osteoporosis. Johns Hopkins UP. p. 5. ISBN 9781421413181. Archived from the original on 23 July 2014. ^ Albright F, Bloomberg E, Smith PH (1940). "Postmenopausal osteoporosis". Trans. Assoc. Am. Physicians. 55: 298–305. ^ Patlak M (2001). 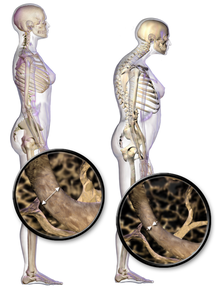 "Bone builders: the discoveries behind preventing and treating osteoporosis". FASEB J. 15 (10): 1677E–E. doi:10.1096/fj.15.10.1677e. PMID 11481214. ^ Hirata K, Morimoto I (1994). "Vertebral Osteoporosis in Late Edo Japanese". Anthropological Science. 102 (4): 345–61. doi:10.1537/ase.102.345.